In 2013, American Airlines rebranded. The classic 1967 logo was replaced with a new logo (seen here) called the "Flight Symbol." Having worked in the airline industry for 19 years, American Airlines’ VP of global marketing, Fernand Fernandez, finds himself in an exciting time for air travel. 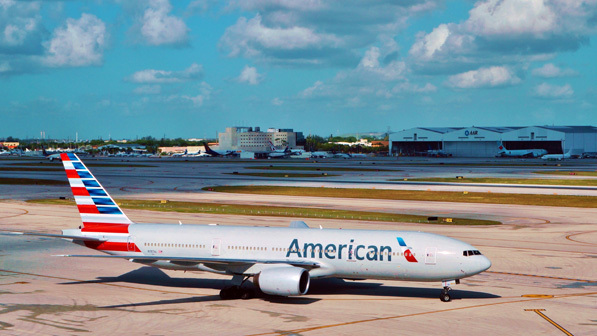 American Airlines, after its recent merge with US Airways, is now the largest airline in the world. So what’s next? Fernandez takes time out of his jet-setting schedule to talk to Hispanic Executive and give some insight into American’s worldwide marketing efforts. HE: Give us an overview of what it’s like to be a major player in the global market for the biggest airline in the world. FF: My team is responsible for all integrated marketing activities across our worldwide network. That includes advertising, sponsorships, customer experience strategy, product—hard and soft—and the airport lounges. Product refers to what we put on the planes, such as seats, aircraft interiors, Wi-Fi, onboard entertainment, food, and amenities. I’m on the road about 50 percent of the time. Being a leader at the largest airline in the world, I’m on the go visiting partners and employees across our worldwide network. We have teams in the United Kingdom, South America, and Asia. HE: How has your role evolved since you joined the company? FF: This industry is not for the faint-hearted. It’s built on change. For example, we’ve just entered year two of our merger with US Airways, with all the changes that entails—such as combining the two frequent flyer programs. We have a team focused on making the merger easier on customers. My role changes depending on the factors impacting air travel at the time. A lot of things can play a role—from a flu epidemic to the economy. For example, when oil prices go down, we benefit from lower fuel costs. But employees of oil companies are flying less, so we lose those travelers. You have to be nimble and able to adapt to change. HE: Do marketing strategies differ from region to region? FF: Every market is unique. We have large bases of operations in Los Angeles, New York, and Chicago, all highly fragmented markets where multiple airlines are vying for passengers. You have to be willing to take risks on all aspects of your work—tone, tactics, and creative—to break through all the noise. And different things work in different countries. For example, in Japan, customers want better business seats, Japanese meals on-board, and they’re particular about on-board entertainment. In New York, having Wi-Fi is more important. HE: How are you extending your marketing strategy to the increasingly important Social Media space? FF: Our social media team is available 24/7. They’re not only an extension of our marketing activities, but a strong tool for customers to get assistance with everything from seat assignments to rebooking flights. Our social media approach varies by country because the acceptance of social media varies by country. HE: How does the marketing strategy directly impact company revenue? FF: Once a plane departs the gate with an empty seat, it’s a lost opportunity to expose a customer to our product. Customers want a solid and reliable customer experience, which is the best marketing we can do. I’m proud of our ability to make travel and connections happen. We’ve got over 100,000 aviation professionals worldwide whose mission it is to make travel great. HE: Where does American Airlines go from here? Will focuses shift? FF: Our CEO, Doug Parker, has a laser-focused vision for the airline anchored around the aspirational theme “Going for Great.” It’s a promise to our employees and customers that each of us is working hard to restore American to being not just the biggest, but also the best airline in the world. Last year was a record year for American, and 2015 is looking to be a great year for our employees and passengers. When we have a good year, it means we can invest in the airline. We recently announced over $2 billion in customer-facing improvements, such as new planes, more Wi-Fi, etcetera. HE: What do you love most about your job? FF: One great aspect of the job is that through our sponsorships, our employees have an opportunity to give back to their community. For example, we just did a Bowl-a-Thon with the [NBA team the Los Angeles] Clippers to support Children’s Hospital in Los Angeles. We also support causes such as cystic fibrosis research and veterans’ programs. I also have a true passion for the industry. I love travel for what it does for people and companies every day. It makes the world smaller, drives commerce, and creates memories.